I thought I’d dreamed up this idea all by myself, but a quick Google tells me otherwise. 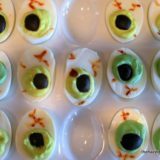 Deviled eggs! Made to look like eyes! 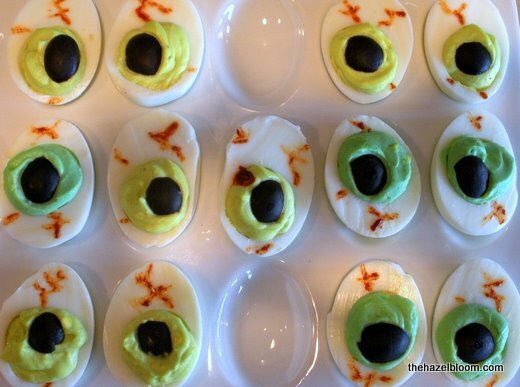 Deviled Egg Eyes…The perfect Halloween hors d’oeurve! I guess I can see how I wouldn’t be the first person to dream this one up. It’s not much of a stretch. Ah well. I still love how these turned out. Pipe into egg halves by the pair. Mix three or four blue drops to the remaining yolk mixture. Spoon into a new Ziploc bag, cut off the tip, and pipe yolk mixture into remaining pairs. 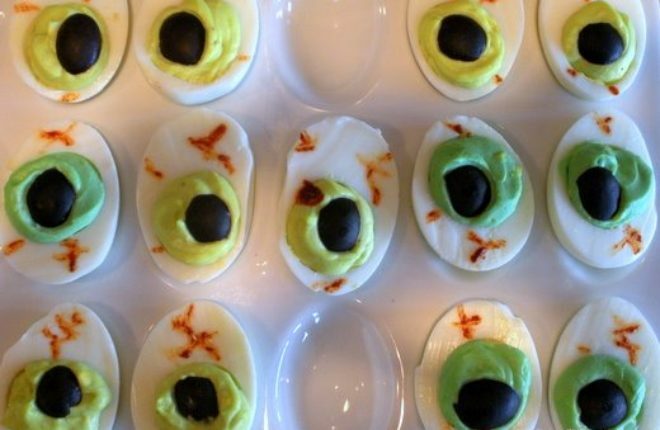 Place them in the center of the deviled eggs (to look like pupils). Pour some paprika onto a plate and wet with enough water to make a paste. Using a toothpick, lightly draw on a few veins here and there.